f you're a moving company, whether large or small, you need the right materials to be competitive and offer your clients the most safe, secure move possible. Most of that revolves around having the right materials to safeguard your client's belongings. Following are some of the supplies that moving companies most often use, or could use. 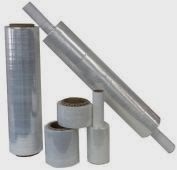 Stretch wrap is a stretchy, clear plastic film that can be used for a variety of applications within the moving industry. Bundling Stretch Wrap - 2", 3" and 5" widths. The 2" and 3" films are on a 3" core and the 5" can ship on a 3" core or a 1" extended core. Stretch wrap is easy to use, will not mar furniture - whether wood, leather or fabric, leaves no adhesive residue like tape can, is clear, and has strong, reliable hold potential to stand up in the many demands that the moving industry places on the items in its care.